Cooking for the holidays can be trying. There is so much to do with the perception of too little time. Planning is key. Prepping as much as you can ahead of time makes things easier. There are tricks or hacks you can use to smooth your path. You can make substitutions instead of making everything from scratch. The trick is making the grocery store your friend. Prepared products are better quality than in the past, and the quality continues to increase. Creme Anglaise is a custard cream sauce used with desserts. It is made with hot milk or cream, egg yolks, sugar, and vanilla. It is vanilla ice cream base. Buy a pint or quart of good quality vanilla ice cream. Let it melt in the fridge. You have creme Anglaise. If you want to up the ante, mix in some chocolate sauce or melt some Nutella in the microwave for about 30-45 seconds. Whisk it in. A quick dessert is crostata also known as a galette. Use store-bought pie crust. Top with sliced pears, apples, plums, or berries. You can use well-drained canned fruit or good preserves. Leave about 1½ inches bare around the edges. Fold the crust around. Place it in the oven and bake according to package instructions. Here is a good savory version with a sour cream crust. The sour cream gives the crust a cookie like snap. Mousse is a great holiday treat. This recipe for Nutella mousse only has three ingredients. Cream, instant coffee, and Nutella. Smoked is a favorite holiday treat. It is readily available this time of year. Dress it up with edible garnish like Italian flat leaf parsley and capers. Christmas morning? A riff on eggs Benedict. Raw spinach with smoked or cured salmon on English muffins or crumpets topped with a poached egg. You could make a quick mock Hollandaise sauce to top it off. For added luxury, you could garnish with salmon roe. For each pound of raw shrimp, use one teaspoon each of black, white, and cayenne peppers. Garlic to taste. Place it all in a plastic bag with some olive oil and fresh lemon juice. Let sit in the fridge for about an hour. Pour everything on a sheet pan in a single layer. Place under the broiler. Watch it closely. When the shrimp turn pink, it is done. 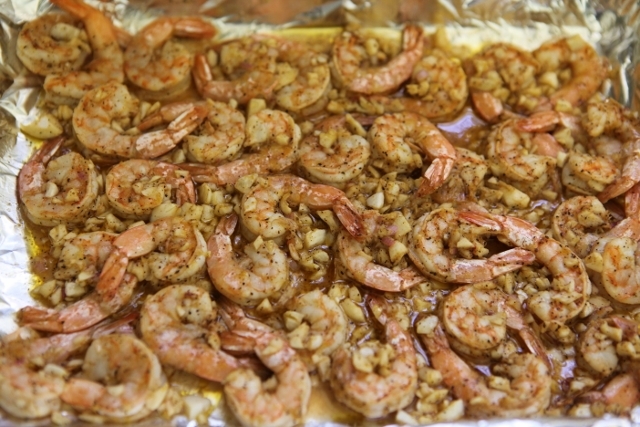 Thawed and deveined frozen uncooked shrimp is good for this. Remember, make the grocery store your friend. Eggs cocotte sounds fancy schmancy French. They are simple to make and add an elegant touch to Christmas breakfast, lunch, or for a first dinner course. Here is a video demonstrating how easy they are to make. Looking for a decadent but easy cake? Hershey’s “Perfectly Chocolate” chocolate cake and frosting is the way to go. The recipe has been on the back of Hershey’s cocoa tins for over 80 years. Here is the recipe with variations. Roast meats and turkey are standards for holiday feasts. Keep it simple. Salt and pepper are your best friends. A well-seasoned roast or bird is just as good, if not better than fancier preparations that require more work and expensive ingredients. One good way to ensure proper cooking time is to take the roast or fowl from the fridge about 45 minutes prior to roasting. This will bring it to room temperature. Check it with a thermometer about twenty minutes before the end cooking time. It should be ten or fifteen degrees under the desired doneness. This will allow for carryover cooking while the tented meat rests. If you are doing ham, get a spiral cut. Just follow the package instructions for cooking and glazing. Whatever your choices are for holiday meals, remember the goal is to enjoy the process and the meal. Make it as easy as possible. Enjoy the company of your family and friends. That is the true gift of the holiday season.